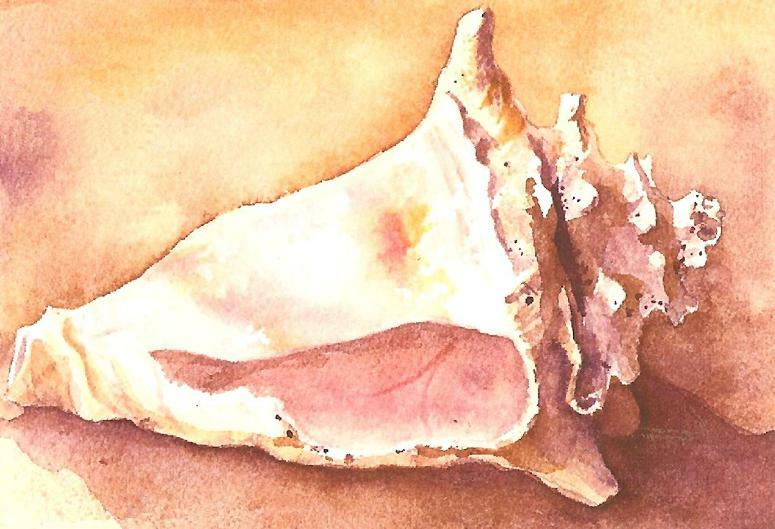 Painting by Carol Boudreau from "Animals of the Reef"
The queen conch is a mollusk. This snail carries an elaborately structured shell with crown-like spires and spikes on the spirally coiled shell. The outer shell is orange and yellow with a beautiful rosy pink flaring lip. The shell is produced by a thin layer of tissue between the snail body and the shell. Calcium carbonate is extracted from the sea by this animal as the source of calcium for shell creation. The queen conch generally grows to 6-9 inches with some up to 12 inches. There are 2 pairs of tentacles on the head that provide touch, smell and light sensitivity. The queen conch buries itself in the sand for short dormancy periods. These creatures move around on the sea floor via a muscular foot that is covered in cilia and mucous. The adults are most active at night. Queen conch is listed as endangered by some organizations because of overharvesting for food and shells. 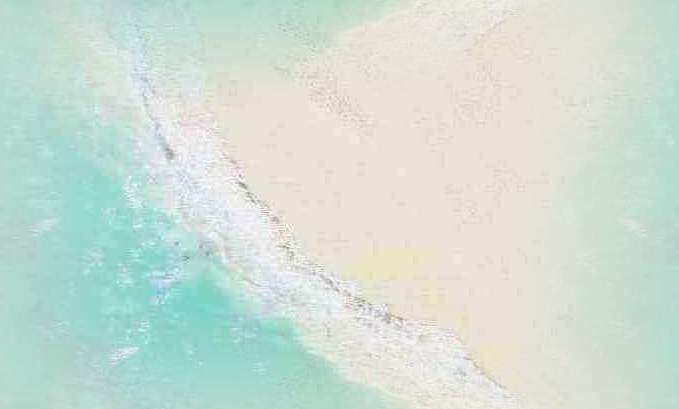 Conch inhabit areas of the main barrier reef, patch reef, reef crest, and back reef. The 1" year of its life, the queen conch lives in shallow subtidal habitats buried in sediment. As they age they move to deeper water. Feeding Queen conchs are grazers that feed primarily on algae, grasses and organic debris. However, in the larvae stage, they feed on plankton. Eating is through a tongue-like organ that contains thousands of tiny teeth-like particles. Conchs have a very complicated digestive system, expelling wastes from the gut located near the gills. Sexual maturity in queen conchs is reached at about 3%-4 years of age. The eggs are laid in gelatinous strings 50-75 feet in length that contain as many as 185,000 to 460,000 eggs. The peak period of reproduction in queen conchs is from April to August.